Parents and teachers can use jigsaw puzzles to improve problem-solving abilities in children. Puzzle lovers also solve jigsaw puzzles for fun and relaxation. Traditionally, creating a jigsaw puzzle has been quite a difficult task, and buying multiple jigsaw puzzles is expensive. Thanks to computer technology, Internet users can now create jigsaw puzzles online. Users simply select any image and use one of several online puzzle-making programs to make and display a jigsaw puzzle online for free. Open the Jigidi home page and click on the "create one" link. 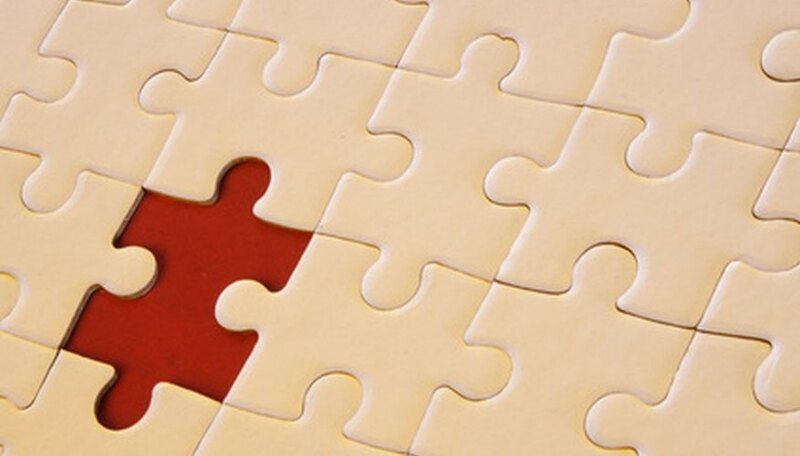 Create an account to make jigsaw puzzles for free with this service. Click on the "Create" button once you have finished creating your account. Click on the "Select image" button to find the puzzle image you want to use on your computer. Select from 15 to 192 pieces for your puzzle on the image preview page and answer the additional questions. Click on "Send it to a friend with MSN" to get the website address for your new jigsaw puzzle. Use the other options to solve it on your own computer, email the link to friends or students, or use HTML code to incorporate the puzzle into your own website. Access the Jigsaw Planet home page. Use the "Browse" button to find an image on your computer for the puzzle. Create a name for your puzzle. You may use the "Advanced Setting" link to change the number and shape of puzzle pieces and rotate the pieces to make a more difficult puzzle. You may select from 10 to 120 pieces. Click the "Create" button. Click "Create" again on the next page to go back to the main page. You can now see all the puzzles you have created on the home page. Click on "Play" to solve your free jigsaw puzzle or "More" to get the sharing options. Use the "Send" option to get the individual website address for the puzzle or email the link. Use the "Put on Your Web" option if you need code to put the puzzle on your own website. Click on "Upload your photos" on the JigZone home page. You need to follow the instructions to create a free account if you do not have one. Log in if you already have an account. Click on "Getting started" from your member page after you have logged in or created an account. Click "Continue" to get to the jigsaw puzzle maker. Use the "Browse" button to find an image for the puzzle and click "Upload" to make the puzzle. All puzzles contain a standard 20 pieces upon creation. Click "Open puzzle." Use the website address of that page to share your jigsaw puzzle. The user can click on "Change Cut" to change the standard 20-piece puzzle to as few as 6 and as many as 247 pieces. You can also send the puzzle as a postcard and provide a link to your puzzle gallery with the "Send as postcard" option. Use the "Embed/Link" option if you need HTML code for putting the puzzle on your own website. Teachers and parents can use people, buildings and other images from history lessons or other classes to create puzzles. Use the puzzles to make lessons more entertaining and help students review facts studied in school lessons. Jimmy Boyd has a law degree from Thomas M. Cooley Law School. He has been writing articles on law and a variety of other topics since 2004. His work appears at Lead-Generation-Tips.com, eHow and Hubpages.com.